Cuadernos de epistemología Nº 6 Juan Carlos Aguirre (compilador). Professors, from different universities in our country and the world, have believed in this academic space. Many professors have researched and delivered both original and translations work from another language through the research group Phenomenology and Science contributing to the comprehensive discussion of relevant issues for contemporary epistemology..
Juan Carlos Aguirre was born in Aguadas (Caldas). He holds a degree in Philosophy from the University of Santo Tomas (Bogotá), a Master in Philosophy at the University of Caldas (Manizales) and he is a doctoral student in philosophy at the Universidad Pontificia Bolivariana (Medellín). He is an associate professor at the Department of Philosophy, University of Cauca. He is the author of articles and book chapters in the areas of phenomenology (Husserl and Levinas) and the Philosophy of Science (Revuelta Historicist and Scientific Realism) and epistemology. A Research Associate (I) – Colciencias, the Director of the Research Group Phenomenology and Science, Category A - Colciencias. 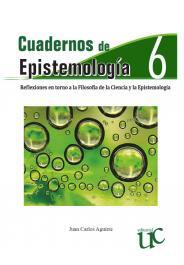 And the Co-editor of Cahiers series of Epistemology, published by Editorial Universidad del Cauca.